Mark S. Mosier | CALEA® | The Commission on Accreditation for Law Enforcement Agencies, Inc.
Mark S. Mosier joined CALEA in May 2013 following retirement from the CALEA Accredited Hayward, California Police Department. With nearly 35 years of law enforcement experience, Mark ended his police career as a lieutenant managing the Information & Intelligence Bureau. Also during his tenure he served as the agency's accreditation manager, as well as in a variety of other assignments. 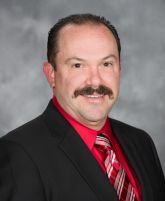 He is a Regional Program Manager assigned to the Pacific, Pacific Northwest, Rocky Mountain, and Latin America Regions and is liaison to the PACs in those regions and to Commission Review Committee F.
Mark holds a Bachelor's degree in Occupational Studies from California State University at Long Beach and is a graduate of the Delinquency Control Institute at the University of Southern California (USC). He was a CALEA Assessor and formerly served as the Vice President of the California Police Accreditation Coalition (CALPAC). He is the recipient of the Hayward Chamber of Commerce Award, the Ron Silva Memorial Award, and the BPOE Elks Lodge Officer of the Year Award.